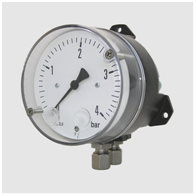 DA12 series is suitable for measurement of pressure, differential pressure and partial vacuum in field of industrial and sanitary techniques. Typical applications are measurements of differential pressure between forward and return flow in heating systems and monitoring of filters, compressors and blowers. Measuring system and pressure chamber are available in different materials to meet various requirements.